Eiki is actually a Japanese brand that's just begun to get distributed in the UK and yes, this is indeed a re-badged Sharp XV-Z3000, but with a few tweaks and a more competitive price point. This means you're getting a relatively small HD Ready projector, with a native 720p DMD chipset by Texas Instruments and Sharp's finely-honed light engine and optics, for a very reasonable £1,500. 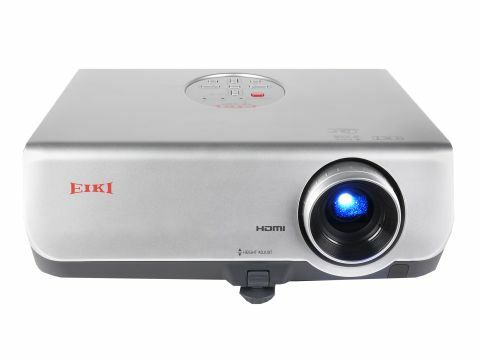 Feed the Eiki some hi-def material and it'll show you what an HD Ready DLP projector is capable of: vivid colours, high contrast, sharp edges and lots of fine detail. Colour reproduction and contrast are stronger than any of the LCD contenders in this price range and there's no visible pixel structure on screen - until you put your face right next to it anyway. It takes a while to get the contrast levels right, but when you do, Blu-ray delights like the Oceans Deep episode of Planet Earth, get the inky blackness of the ocean bottom reassuringly black rather than just dark grey. Before you rush out and snap up Eiki's entire stock though, there are a few caveats. This is definitely step-up territory in terms of price and yet there's no variable iris and no optical lens shift. Instead you have to rely on digital keystone correction, which significantly compromises the picture. The throw ratio is very short and the zoom seems to have little effect on the image size, so you're limited as to where you can install it. And the operating noise level -30dB in 'eco mode', 33dB at other times - is a bit distracting. Keenly price and well made, this Eiki is worthy of consideration. Yet, pressure from increasingly competitive Full HD projectors make it not the bargain it might once have been.